It's my birthday! Since I've been so busy adulting and dealing with mortgage stuff It really crept up on me this year. I'm totally unprepared! I've got no plans, no cake, no nothing. Thankfully my food blogging habits have me surrounded with piles of seasonal sweets, so instead of celebrating with a cake this year, I'm going to munch on all this stuff and knock out some long overdue reviews. 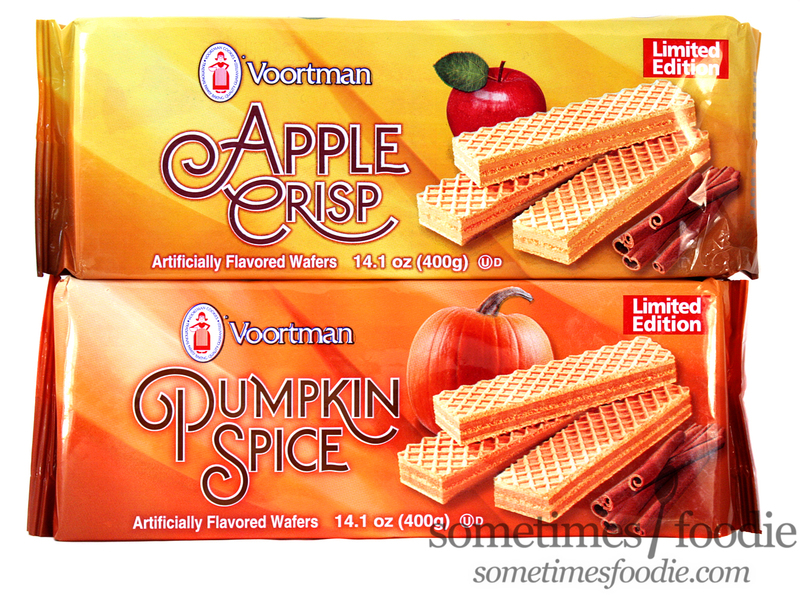 First up, these limited edition fall flavored wafers! Voortman's is a brand I had seen around, but never really paid attention to. I've had their vanilla, chocolate, strawberry and coconut wafers over the years, but could they have been releasing new seasonal offerings all this time under my foodie-radar? I only happened to noticed these two flavors because they were on an end-cap near the Oreos. If they weren't featured like that I never would have known these existed. This packaging might not look at that impressive or eye catching, but this is a big step up from Voortman's original design. (Which features some creepy looking clip-art cookie-people.) Although I've seen much more appealing seasonal packages on the shelves, this gets some points for being a lot more mature and modern than the brand is known for. So packaging gets a "You tried" gold star from me as far as looks, but functionality gets two thumbs down. There's no way to reseal these! 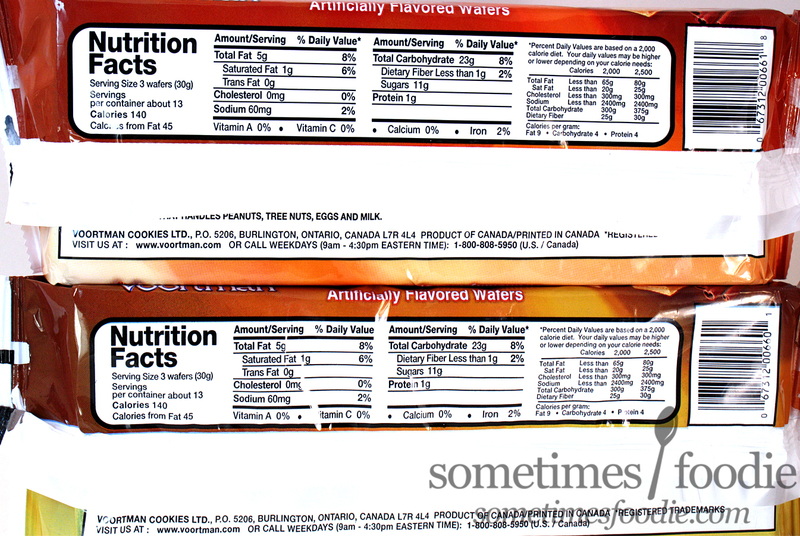 It's something I've always hated about these wafer cookies. In my house we always put them inside a zip-lock bag and then put that in a Tupperware container, but if you're eating these in the office, or on the go like I am right now, there's no way to keep them fresh and crispy. 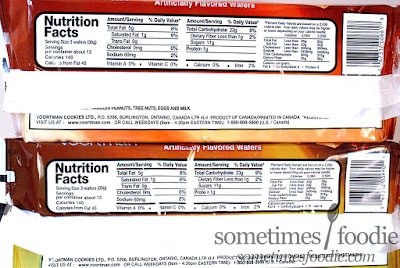 It's not a HUGE annoyance, but it's something I figured I should point out since wafer-style biscuits are all about their crunch, and after a day or two of being open these reach stale-city. The real question is, are these fall flavors tasty enough for me to want to eat them even if they get stale? Let's find out! 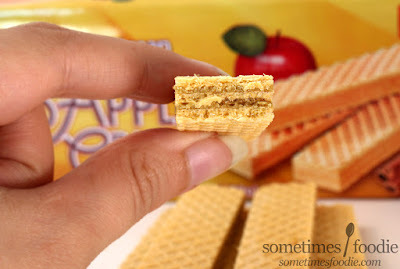 Apple Crisp had a significant amount of wafer-fall-out when I opened the package, and I noticed that a lot of the wafers easily separated from their creme-filled-layers. I picked out a few of the more together cookies and made my usual food-pyramid. (If it stacks, you bet your buns I'm going to stack it into a pyramid. I'm obsessed!) The apple crisp wafers smell sweet and cinnamon-y with a pretty prominent apple juice aroma. They instantly remind me of apple-based breakfast cereals and oatmeal! So far we're off to a great start! 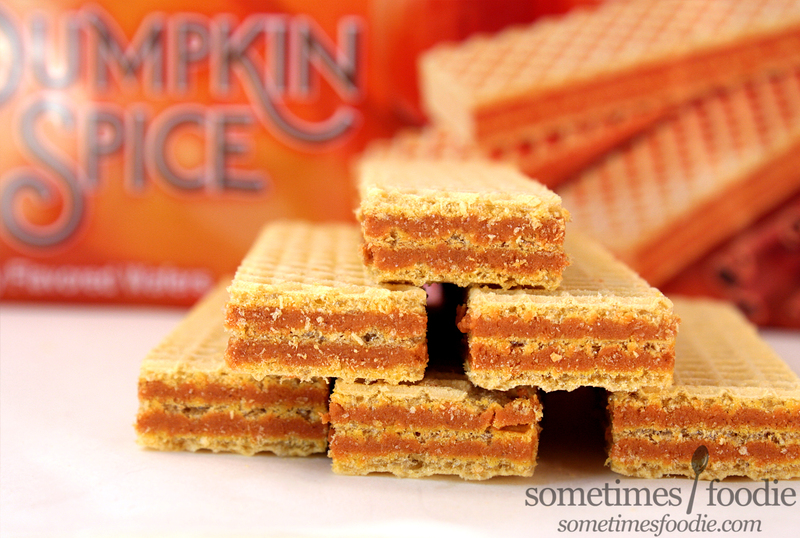 Once opened, the pumpkin spice wafers have a pretty intense spiced aroma. I can smell ginger, nutmeg and cinnamon, but it's not cinnamon-heavy like other pumpkin spiced items tend to be. This is more nutmeg-based and this spice blend just screams FALL. I took a bite and there's no actual pumpkin, just the usual spices, but it's still pretty good! 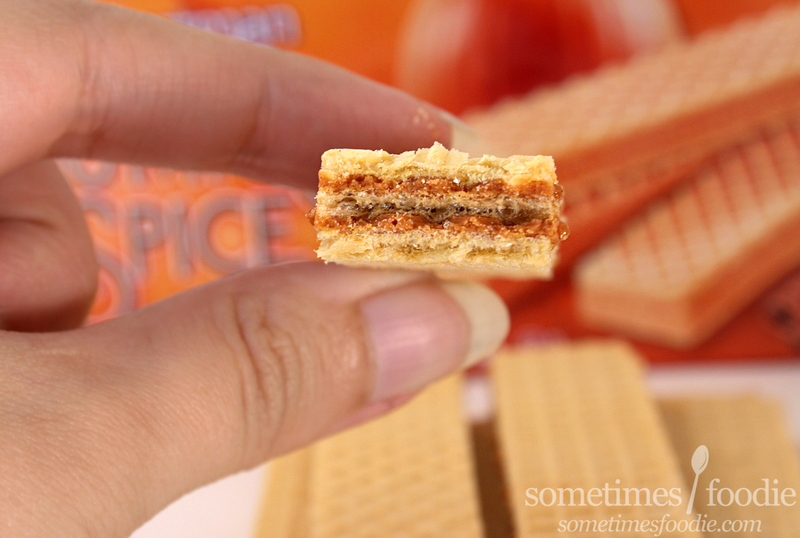 The spice blend is very reminiscent of pumpkin pie, or those Pumpkin Ginger Mouthfuls I loved from Trader Joe's, but with a hint of salt and lots of wafer crunch. I like that these aren't overly sweet, or cinnamon-heavy. It would pair nicely with tea or coffee, but I find this flavor to be less snackable than the Apple Crisp due to the cloying intensity of this spice blend. Honestly, both of these flavors were WAY better than I ever expected them to be, and they're really affordable, so I suggest checking both, but what it really boils down to is your personal preference. 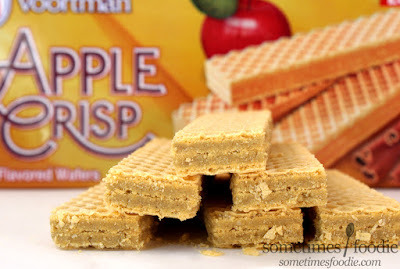 If you like bright, tangy, apple flavors, apple pie, and apple cider, these Apple Crisp wafers will be perfect for you this fall. If you're a pumpkin-obsessed PSL drinker who lives, breaths, and sweats pumpkin spice, this bold spice blend will warm your heart and your taste-buds. Me? I surprisingly lean more towards the apple, and normally I'm not a fan of apple flavored non-apple things, but I don't think we'll have any issues polishing off both packages before Thanksgiving. On a Pumpkin Scale of 1-5 (5 being the most pumpkin-y) I’d give this a 4. They've got a bold spice blend, but it'd be nice to see a little pumpkin in the ingredients.